True love for Volkswagen’s and Southern California are two things that have always just gone together. 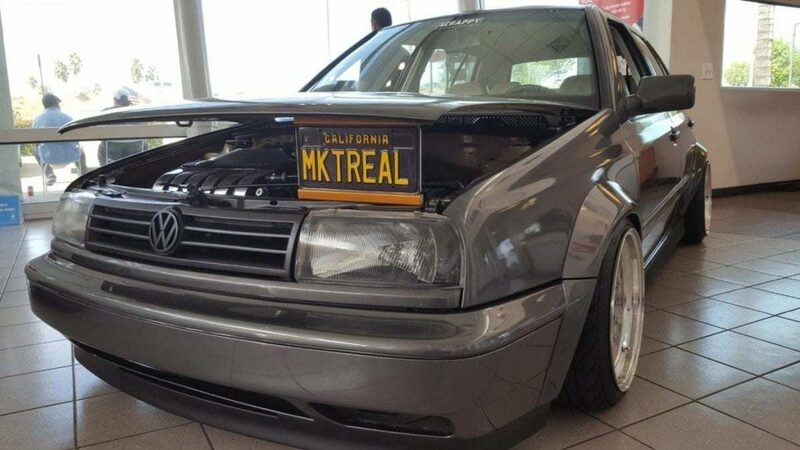 And nobody truly ‘gets’ that like Ontario Volkswagen. For the past two years, Ontario VW has altered their entire businesses operation for what would otherwise be a very busy day. 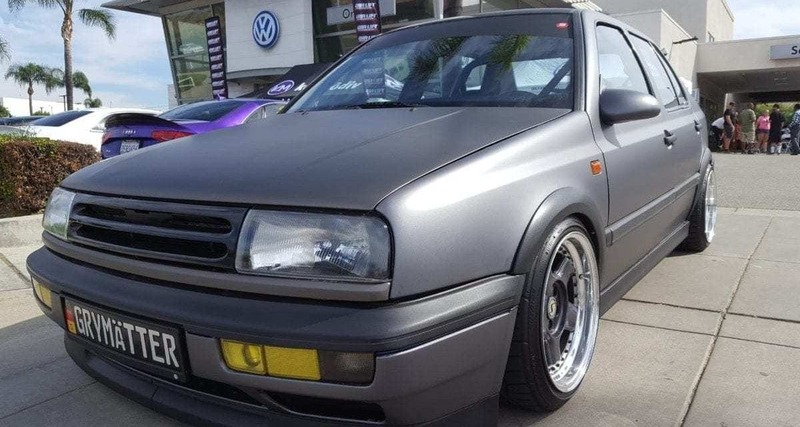 And they’ve done that to morph their dealership in a venue for all types of Volkswagen fans to gather, show their cars, swap their car stories and share their passion for all things V-Dub. And note the ‘all-types’ indicated above. If you’re already in the ‘VW-know’ then you’re aware of the difference between air-cooled and water-cooled. 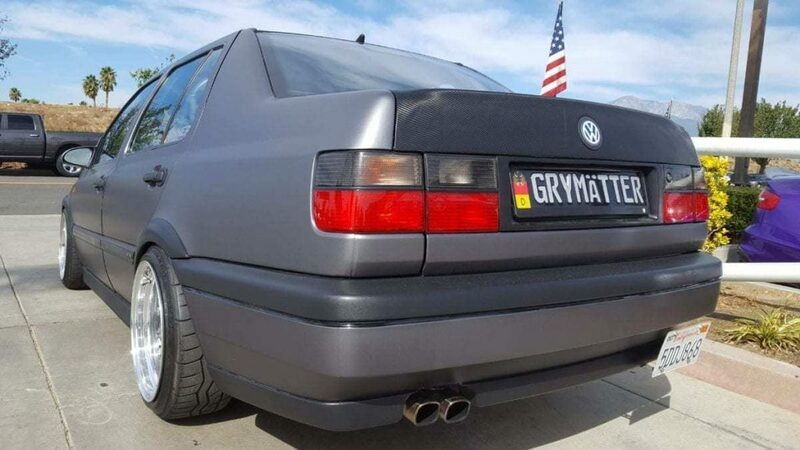 You see, there’s a division among VW enthusiasts. A fun-loving division for sure but a partisan divide nonetheless. So much so that there are entire car clubs dedicated to one and the other. 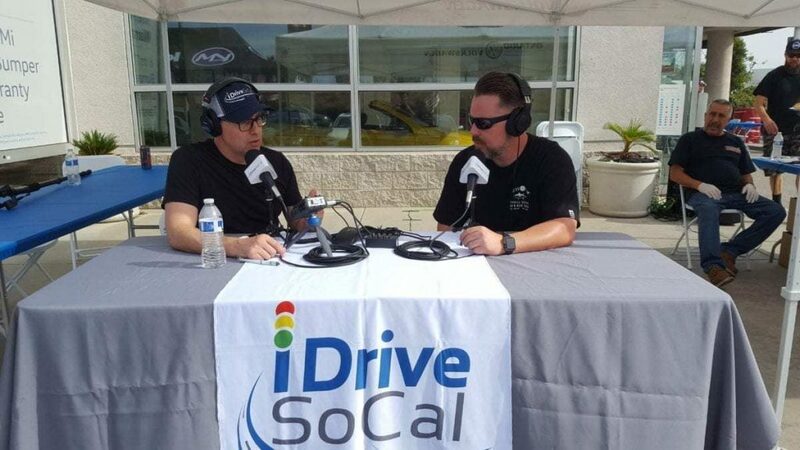 In this iDriveSoCal Podcast, Ontario Volkswagen’s 2nd Annual Oktober Fest Car Show, we talk to the leadership of one of the water-cooled clubs and learn more about their growth plans to share their brand of VW-Love. Mike Pitman: We try to do stuff our own, we try to have cars that are a little bit beyond the norm. They may never be perfect, they may never be done, but they are built by us in our garages. Jimmy’s house always looks like Ontario Volkswagen. 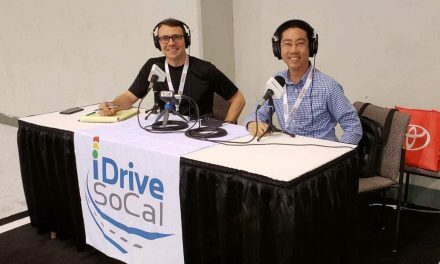 Tom Smith: Welcome to iDriveSoCal, the podcast all about mobility from the automotive capital of the United Stated, Southern California. I’m Tom Smith, and as you can probably hear, I’m not inside in a studio. We’re actually at Ontario Volkswagen in the Los Angeles suburb of Ontario, California, and we’re outside at the Oktoberfest, 2nd annual Ontario Volkswagen Oktoberfest. We’re podcasting outside. Ontario Volkswagen is just off the 15 and also right by Ontario Airport so just as we were doing that open, a jet was flying overhead. But joining me is Mike Pitman from … Where are you from? Tom Smith: From Wildomar California. 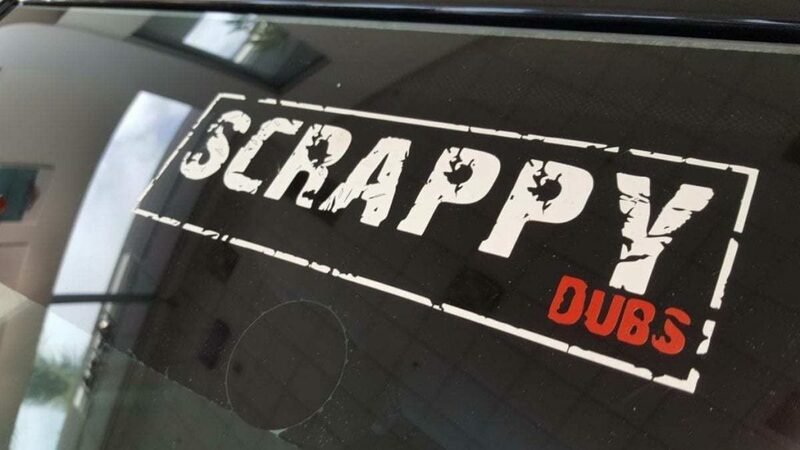 And Mike is part of not only the Oktoberfest Auto Show, here at Ontario Volkswagen, but one of the clubs that’s involved in this show and your club name is Scrappy Dubs? 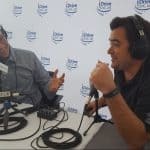 Tom Smith: Mike, thank you for joining me for the iDriveSoCal podcast. 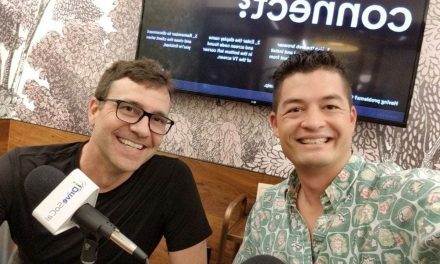 Mike Pitman: Thank you for having me. 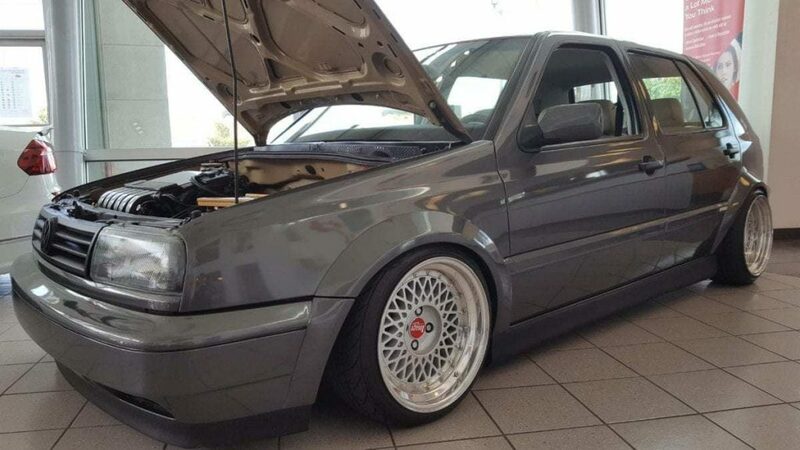 Tom Smith: Tell me, what… The Scrappy Dubs, I know Jimmy Willhide who’s the service manager here, service director, service advisor, whatever his exact title is here at Ontario Volkswagen, I know that he’s part of the Scrappy Dubs Car Club, but tell me a little about it. How’d you guys get started, and what do you do? Tom Smith: Other than participate at Oktoberfest here at Ontario Volkswagen. Mike Pitman: Right, right. We’ve known each other for a long time. We’ve been friends, practically kind of grown into a family. Practically what we do, we’re just a group of friends. We all have the same love, same enthusiasts for Volkswagen, for European cars, and we all got together and we help each other out. And we have different strengths and when somebody needs help with a car we get down to the garage. There’s late nights and get some good music going and we put together our crazy ideas and we make the stuff happen, so that’s how it became. And we try to stand out a little bit. We try to do stuff our own, we try to have cars that are a little bit beyond the norm and like I said, the cool thing about all of our cars is they may never be perfect. They may never be done. But, they are built by us in our garages, and like I said we have a great time with doing it. I think that’s what friendship’s all about, growing up and growing older and constantly evolving, constantly changing stuff and doing stuff for the love of the cars that we love to drive. 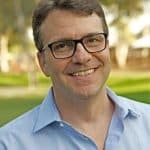 Tom Smith: Did you guys go to… Are you all southern California, all high school buddies or college buddies, or just kind of meet somewhere along the line or…? Mike Pitman: I had my own mobile repair business, so I did that. That’s kind of how I met Jimmy and we got together, repaired some stuff for him and started hanging out and we would literally Friday, Saturday night. It was almost either at Jimmy’s house or other friend’s houses and we’d hang out late at night, and multiple times that I had probably four or five cars stored at Jimmy’s house and yeah, I mean Jimmy’s house always looks like Ontario Volkswagen. Tom Smith: I know he’s got seven or eight, or six or eight. I know he’s got a number of cars on his own. Tom Smith: If you’ve got a few cars stored at his place too, he must have a little bit of space. Mike Pitman: Yeah, he did and he still has more space now. There’s always been a little bit of competition between us, between who has more cars. It’s always changing. Tom Smith: You have a number of cars at the moment? Mike Pitman: About 10. Somewhere around there. 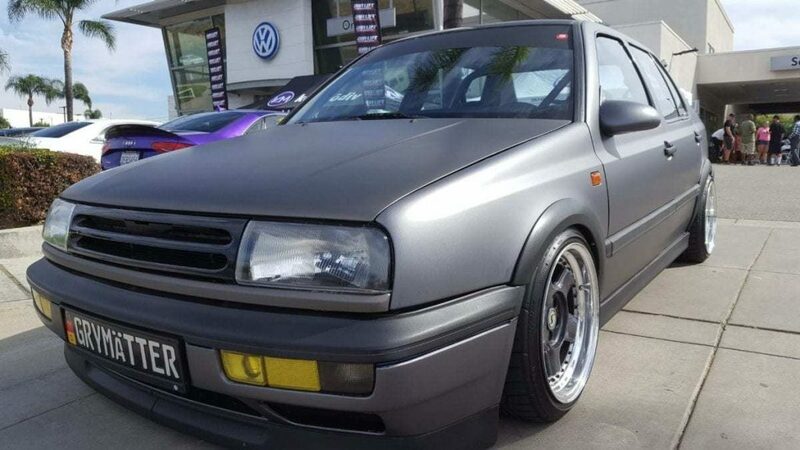 Mike Pitman: VW Audi, trucks, some big 4 wheel drive trucks, boats, jet-skis. We have quite a bit of stuff. Tom Smith: Let’s talk Volkswagens specifically. What car did you bring here today? 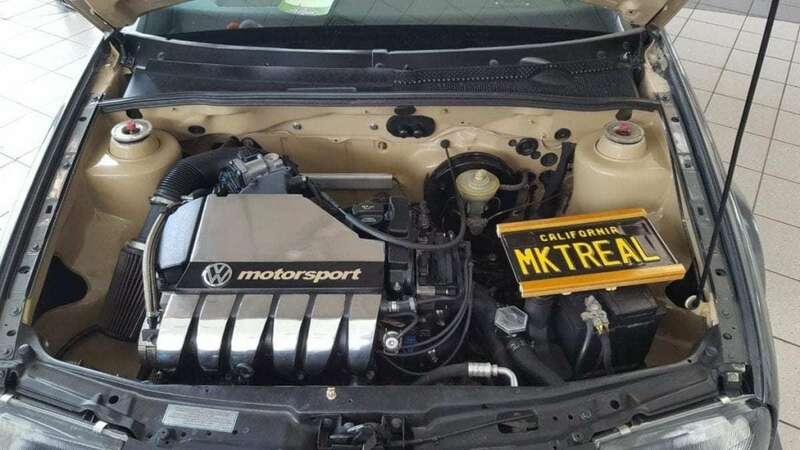 Mike Pitman: We brought my wife’s Volkswagen Mark 4 Jetta GLI. Tom Smith: Mark 4. And for those of you that have listened to the podcast, you know that Mark 4 is just interchangeable with generation, right? Tom Smith: Every time a car is completely redone, that’s a new generation and same thing for Volkswagen. They just use Mark as a German thing, right? Tom Smith: Got you. And we were looking at your wife’s car in the dealership actually. 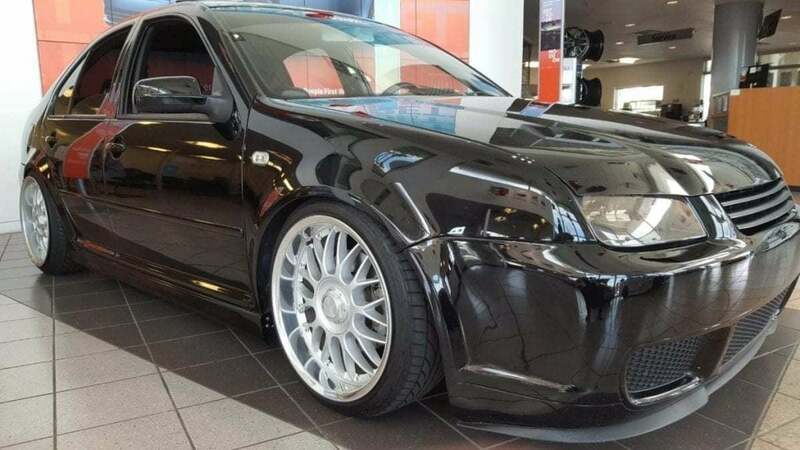 It’s literally parked in the dealership right now. Tell me about some of the things that you guys did. I know the hood was something special that you did, where it comes over the headlights just a little bit. Tom Smith: It’s called a Boser? Mike Pitman: Boser hood, yes. Tom Smith: And that just like a style? Mike Pitman: Yeah, it’s a style. It’s for people who kind of want a little bit more of an aggressive look and there’s different variations. They do sell pre-made kits that you can weld on. That one was actually custom. Like I said, cereal boxes and cutting out templates onto metal and making it happen. She wanted a little bit of a one. She didn’t want one too crazy, so like I said that was done. Welded. Most of all the bodywork was done between me and a friend of mine, Dave Ellidge who’s the one who painted the car. Everything from that to all the interior being redone. Suspension, bushings, coil overs, the custom Euro trunk on the back as we were speaking about. Mike Pitman: Yeah, there’s quite a bit of things done to it. We didn’t want to go too far-fetched with the car, like most of our other cars, because she does drive the car every single day. The car sees a freeway, it sees the rocks, it sits in traffic. I mean… and if that car’s not in tip-top shape I definitely hear about it. Tom Smith: And regarding rocks, you mean, the suspension’s not so tight that you’re ruining your wife’s back as she drives it to and from work every day. Mike Pitman: If that Starbucks is spilling inside the car, we’ve got a problem. So many other businesses, and so many other passionate hobbyists, whatever, they start in the garage. Knocking around, doing things for fun with a couple of friends and there’s really no difference between what Steve Jobs, Steve Wozniak did… except the big business, the advent of Apple of course. But it’s on a similar plane and the funny thing is here at Ontario Volkswagen, I don’t know if you know the history of this dealership but Earl Reed who’s the general manager here, I’ve had a couple of talks with him and this store was actually started by Mr. Sherman, and Mr. Sherman started as a hot rod shop. Tom Smith: …and the rest of the guys messing around and hobbyists, passionate hobbyists and taking it to the next level. Tom Smith: You never know about these things, but there’s a little irony that I wanted to point out. Tom Smith: You brought your wife’s car here. Now, are you one of the judges for the competition? Mike Pitman: Yes, I did help. Tom Smith: The judging’s done? Tom Smith: Alright. I didn’t know that and Jimmy didn’t share that with me. Do you want to share any insight or… You know what, I don’t want to ruin it. Mike Pitman: Well, what we kind of look for is… we kind of look for the whole package. A lot of cars look really great on the inside and then on the outside, vice versa. A lot of the cars we look at, a lot of the cars… some of the cars are still here anyways. We like the whole package. Mike Pitman: We like to see things that have been done in every aspect of that car. Tom Smith: Sure. Sure, sure, sure. Focusing back on yes, we are here and the auto show’s going on the Oktoberfest auto show, but Scrappy Dubs… The club started as you guys buddies, and what are your activities now. Do you have a website? Do you have a Facebook page? I know you mentioned you have a big event coming up so it kind of sounds like a club that is potentially growing into something. Tom Smith: You just want to share the passion. Tom Smith: 2019, July 20th, 2019. Mike Pitman: 2019 down on San Diego Harbor so literally it’s Spanish Landing is a park. It’s across the street from the airport, San Diego Airport, and it’s going to be beautiful. Great weather, of course, you know San Diego, and we’re probably going to be exhibiting 150 to 200 cars. Tom Smith: It’s going to be a show but it’s going to be a gathering. A Woodstock if you would, right? Tom Smith: But of Volkswagens and of people getting together and enjoying. Mike Pitman: Right, and you can bring the whole family and come down and have a great time and that’s kind of what we want to be able to bring back into, where you’re able to come down. You don’t have people who are bored, sitting around. Everybody’s able to come. Everybody’s able to have a great time and share the love together. Tom Smith: I’m sure more details of that are going to come out as it gets closer because we’re a number of months away right now. Tom Smith: But how do people find you guys, Scrappy Dubs, wherever online. Facebook or Instagram or website. Give us the stats of where they can find you. Mike Pitman: Well, a good friend of mine, Mike, he’s normally posting stuff every single day. Tom Smith: Are we talking about on Facebook? Mike Pitman: Yes, Facebook and Instagram. Tom Smith: Facebook and Instagram. What is the… How do you find you guys on Facebook? Mike Pitman: Our name on there so far is Dubs by the Shore. Tom Smith: And that’s D-U-B-S by the Shore. B-Y the Shore. Tom Smith: And then… So that’s for the event. Do you actually have a Facebook page for the club itself? Mike Pitman: We do have one for Scrappy Dubs and that’s exactly how it’s spelled. Scrappy Dubs. Mike Pitman: Yes sir. And we mostly just share our love, so the things we do on our cars. Like I said, right now we just got done completing a right-hand drive Mark 3 turned into a Bento now. 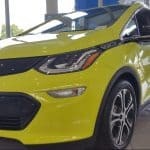 Tom Smith: A right-hand drive which… For those of you listening that don’t know, literally they move the steering wheel and all controls of the vehicle from one side of the car to the other, just because they love the cars. And they can. Mike Pitman: Exactly. And just to be different, just to have the car kind of be a little different from the rest and just to try out our luck and our skillset to see if we’re able to do it, and the only way to test it out is to jump both feet in. Tom Smith: Alright, well that’s cool. I look forward to seeing that car. Facebook you’ve got Scrappy Dubs, Dubs by the Shore, and then Instagram? Mike Pitman: Same thing. 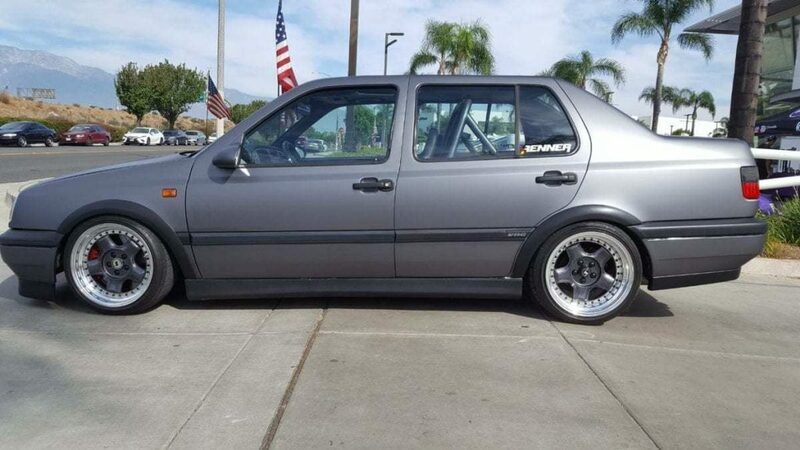 We also have SoCal water cooled as well. Tom Smith: SoCal water cooled. And the significance of that is from ’84 on its water cooled. From ’84 prior it’s air-cooled for all the Volkswagens. Mike Pitman: Yes, yes. SoCal water-cool we like to just share great cars, so anybody’s cars. Tom Smith: Is that a website or is that Facebook? Mike Pitman: Facebook. Facebook and Instagram as well. SoCal water cooled, we just share the love. We go on there and we share a lot of cars. Cars that we come across, cars that are inspiring to others. Scrappy Dubs are mostly our cars. We like to just share progress on things that we do, and then also Dubs by the Shore for the show we’re having July 20th. Tom Smith: Man, you guys are busy. You’ve got social media management going on here. Tom Smith: SoCal water cooled on Facebook, Scrappy Dubs on Facebook, and Dubs by the Shore on Facebook. Tom Smith: Alright. 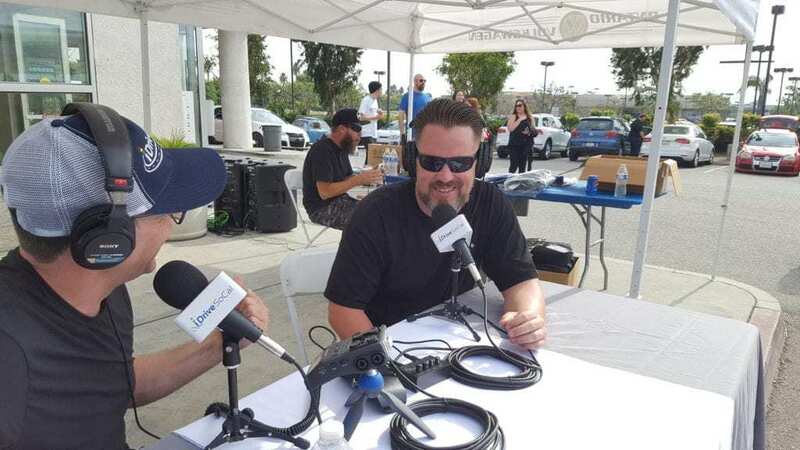 Mike Pitman of Scrappy Dubs, SoCal water cooled, and Dubs by the Shore, thank you for coming on the iDriveSoCal podcast here at Ontario Volkswagen during the Ontario Volkswagen second annual Oktoberfest, 2018 style. Is there anything you’d like to add before we wrap it up? Mike Pitman: I just want to say thanks for having us on. I appreciate it. It was great talking to you, and like I said this is a great event and I’m glad you were able to come and make it out. Tom Smith: Thank you sir. Thank you for joining me and we’ll look forward to doing it again in the future. Who knows, maybe I will come down to Dubs by the Shore. We’ll have to see. Mike Pitman: Definitely. That’d be awesome. Tom Smith: Alright Mike, thanks again.